Wartime Mission: The B-25J Mitchell was named after General Billy Mitchell, a famous Army Air Corps general of the 1920s and 1930s. It proved to be one of the best weapons and was possibly the most versatile aircraft of WWII. Heavily armed, it was utilized for high- and low-level bombing, strafing, photo reconnaissance and submarine patrol. It’s most distinguishing role was in the historic raid over Tokyo in 1942 by the Doolittle Raiders. 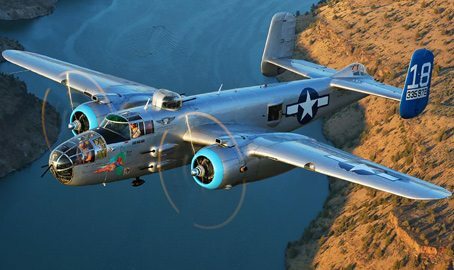 The B-25 saw duty in every combat area flown by the Dutch, British, Chinese, Russian, Australian, and US forces. Our particular B-25J Maid In The Shade served her wartime duty with the 319th Bomb Group, 437th Squadron at Serragia Airbase, Corsica. There it was assigned Battle Number 18. The plane flew 15 combat missions over Italy and Yugoslavia between November 4 and December 31, 1944. The majority of the targets were railroad bridges. By 1947 there were only a few hundred B-25s remaining that performed a variety of training, reconnaissance, and support roles. Civilian use also included utility, transport, fire-fighting, and agriculture duties. What’s it like to be a B-25 pilot? Price: $325 per seat in waist gunner compartment or $650 per seat in flight deck. Accessibility: Must be able to climb ladder and into front and aft sections.